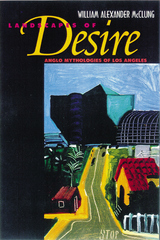 To those of us who look at Los Angeles and see no sense at all, Landscapes of Desire offers a vivid and rewarding account of the particular visions that drove the period of Anglo dominance in the Los Angeles region, from about 1850 to about 1985. William McClung's fascinating essay, supported at every point by wonderful illustrations, shows that Anglo settlers and developers wanted nothing more than to make sense of their surroundings, but that their two dominant paradigms were at war with each other. Anglophone Los Angeles, McClung says, has tried strenuously to reconcile two competing mythologies of place and space: one of an acquired Arcadia--a found natural paradise--and the other of an invented Utopia—an empty space inviting development. The collision between these two underlying ideals is still present in the ambivalence at the heart of the city's and region's understanding of themselves. The Arcadian dream of nurturing inherited beauty entailed idealizing the region’s Hispanic past. Yet that past was simultaneously belittled by the utopian vision of arid landscapes watered into Anglo plantations and ranchos reshaped into cities. From Helen Hunt Jackson's 1884 novel Ramona to the work of artists David Hockney, Edward Ruscha, and Terry Schoonhoven in the 1960s and after, Los Angeles has been an arena of competing and often incompatible constructions of ideal place and space. Looking at architecture, landscaping, literature, historiography, painting, conceptual art, and such ancillary activities and crafts as booster pamphlets, real estate promotions, and citrus box labels, McClung presents a new and refreshingly revisionist view of the city’s growth. Examining designed spaces, including buildings, parks, freeways, and whole neighborhoods and communities, he gives readers a strong sense of the contradictions, failures, and triumphs that continue to govern L.A.'s image of itself. William Alexander McClung is Professor of English, Emeritus at Mississippi State University and author of The Architecture of Paradise: Survivals of Eden and Jerusalem (California, 1983) and The Country House in English Renaissance Poetry (California, 1977).